Wireless Heart Rate Monitor (No chest strap) We are pleased to offer you the chance to purchase our Wireless Best Heart Rate Monitor. You can accurately track your heart rate using the touch pads and count the calories burned during your daily routine which will help you maintain your weight and your workout intensity by using your pulse rate chart so that you can adjust your workout routine at a mere glance. It will also help maximize your training and optimize your health by knowing your exercise mode through this product – without any itchy chest straps. It is completely wireless and therefore nothing would take away the beauty of your surroundings or running thoughts by distracting you with those irritating wires. The super sporty look gives this Heart Rate Monitor an edge and it can be your style statement. no need to worry about it getting wet. With its high-capacity lithium battery, it will go on and on with you in your daily routine – eliminating the need for charging. The timer maximum is 10 hours and it can measure up to 9 hours, 59 minutes and 59.99 seconds. 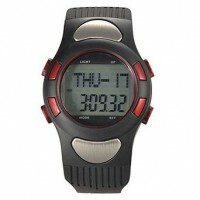 This Heart Rate Monitor is of high strength which will help keep you focused on your workout. 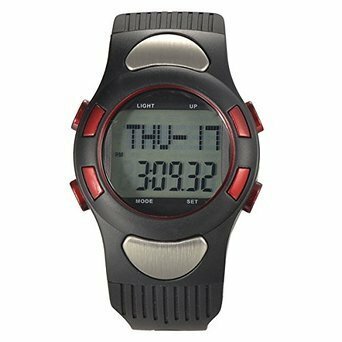 It is not only a Heart Rate Monitor but also a multipurpose product – it has a Pedometer which will keep track of steps taken whilst simultaneously recording Calories Burned, a day-to-day Watch, a Stop-Watch, Timer and Auto-Calendar functions. It has a built-in option of hourly chimes to help keep you alert. It has the added convenience of giving you the option to choose between 12-hour or 24-hour time formats. Displayed in two rows making for clearer visibility. Useful modes enables it to stop, auto-repeat or count-up. This high-tech product can count up to 9999 clock hours and comes with a countdown function. Will fit wrist sizes from 6″ (15mm) to 8″ (20mm) it is 1.5″ in diameter. A great Halloween, Christmas gift idea for sporty and health-minded individuals.